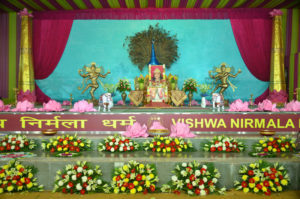 It was indeed a historical and golden moment for Delhi’s Nirmalites when The Divine Herself advised them to have a plot of land to make an ashram for their collectivity which She forecasted to grow tremendously. The Delhi Sahaja Yogis took it up as a mission to achieve. The yogis started to search for the appropriate place to accomplish the desired goal. 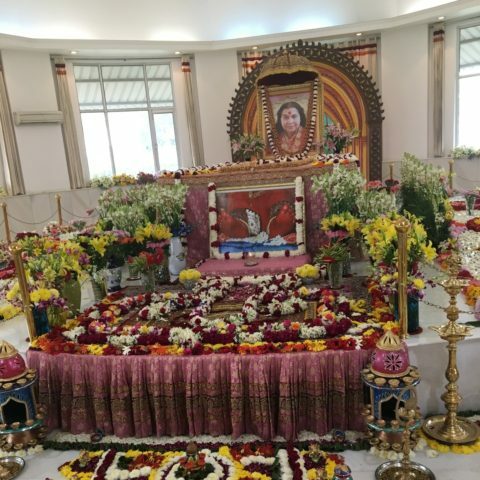 After a couple of months’ search, a five acre plot of land available for sale was shortlisted and the pictures of the same with all geographical and other descriptions were presented to Shri Mataji for Her approval. The Divine Mother went through the proposal and immediately accorded Her permission to go ahead. With all the Divine Blessings, the proposal to buy the available piece of five acre land was materialized. Soon thereafter, another piece of two and a half acre of land, adjoining the acquired area also came up for sale and the same was also settled and purchased by Her grace. 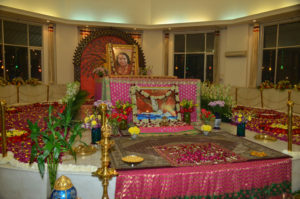 After taking over the possession of land, the Sahaja Yogis requested Shri Mataji to bless and name the proposed ashram to be opened on this auspicious land. The Divine Mother then described its significance as a “Dham” i.e. “Divine Abode”. Hence, the Name “Nirmal Dham” was christened. Nirmal Dham, as such, is not only the Adishakti Peetha, it is ‘Sampoorna Adishakti Peetha’. A double storey hangar of 15000 sq.feet area each has been constructed to accommodate some 2000 Sahajayogis at the times of Seminars/ Events. A new neat and clean Toilet Block, enough for 100 people at a time, has been built adjoining the hangar. A huge kitchen, sufficient to cook for 20,000 people has been built. A beautiful canteen with tiled flooring and walls has been constructed. It serves homely meals, snacks, tea, cold drinks etc. to the visiting yogis. A beautiful grassy lawn has also been developed in front of the canteen. Six well furnished A. C. Rooms with attached baths, drinking water and tea facilities are made ready for visiting yogis. Online booking could be done. Ladies and gents well furnished dormitories to accommodate 100 yogis (approx.) have been prepared. Besides all this, rows of lush green shady trees, blooming rose plants in abundance and seasonal flowers make Nirmal Dham a Silvan Retreat worthy of visiting again and again. 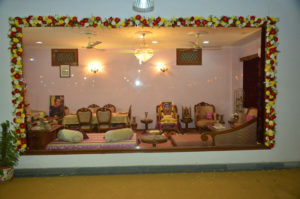 Restroom constructed for Shri Mataji has now been metamorphosed to a beautiful Museum displaying photographs, furniture, and other articles used by Shri Mataji. S. Yogis sit before it and meditate with great reverence for the beloved Mother. On the left side of the Museum, on a two feet raised Kota stone flooring platform, in a well protected transparent glass enclosure, the Adishakti Rath (well maintained Mercedes car used by Shri Mataji for many years ) has reverentially been displayed. It will be seen by the future S. Yogis and their descendants.